Doubt everywhere | Јадовно 1941. By comparing Ustashas’ confessions, statements from witnesses and other evidence concerning transportation of people from and to Velebit, it seems very clear that Ustashas were asking themselves: where to place these people and where to kill them, on Pag or on Velebit? How else we could explain why Ustashas moved the killing sites? Remember, they brought to the island people from Velebit, from Gospić or Jadovno, where the killings were a constant, and then they took some groups (how many?) from Pag and sent them to Velebit, where all of them were killed, whether next to the sea, on Oštrije, on the road to Jadovno and in Jadovno itself, or God knows where!? Often we ask ourselves, why bother with this entire trip when they could have simply killed them in Jadovno? The following texts concerning several discovered pits on Velebit above Pag, documents of the Italian military who found these pits and sanitised them, tell us more about it. “… They put us in some sort of a truck and drove across Velebit. While descending from the mountain towards the sea, Ustashas suddenly stopped and drove us back to Jadovno. We did not understand why they drove us further when they killed everyone else here. There I found surviving Jews from the camp on Pag. Amongst them was Alkorn, called Hodža, a well-known man in Mostar. He told me that all people from Mostar he knew, amongst them my father, Vaso Tošić and others, had been killed in the camp”. In this diabolic game it is really hard to determine why they acted as they did. The whole situation was pathological as a whole, just as the individual actions were, and wwe will talk about that next. 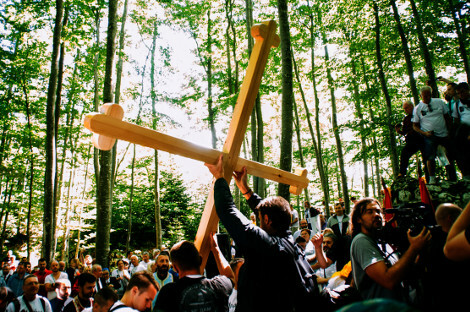 As far as the camp, or a part of the SLANA camp where Orthodox Christians, Serbs were, is concerned general information provided by Dr. Radan on the Jewish camp applies for this part too. Beside his testimony, we can make conclusions about the Serbian camp according to the dead, pits they were thrown into, statements made by Ustasha and boatmen, how some groups that were arrested were taken from their houses and villages straight to the slaughterhouse and never saw neither of the camps. According to statements of guards that were tried, we draw conclusions how the prisoners were treated, where were they taken to be killed, but we do not have a wider authentic statement about their life in the camp and their destinies except from that given by Dr. Radan, who lived next to them, working together, although separated and unable to get close. Dr. Radan saw how they lived and how they died. That is why his testimony, albeit short, is so precious. The author can confirm that not only camp inmates were listening to this machinegun fire, but that we, residents of Pag also could hear it every evening and often during the night. Local Ustasha supporters and leaders tried to persuade the people of Pag that there were military exercises in SLANA! This gunfire from SLANA made all vales and hill around the Pag bay echo and Ustashas could not hide it. Both we and the people who are testifying will keep coming back to the questions on number of inmates and people killed. These same questions will be treated in several ways, not just by testimonies on what people saw or later dug out! All of the discoveries suggest the number was great and horrifying. Moving execution sites, sending inmates from one side to the other, constant transport with boats, the amount of work done, etc. are all evidence on the number of people that were there, but in the end we will come to conclusion that the real number cannot be determined. Not even statements from the survivors, as Dr. Radan warns us, do not have to be precise, especially when it comes to numbers. Those statements given in the past, recorded long time ago, were not given during trials, or with history in mind. They were given to testify on horrors, stories and images of horror that had to be told someone, to show what sort of hardship people endured faced with such crimes. The statements were given to people who recorded them only later, so more of what they wrote down was their own shock rather than accurate chronicles. That is why such records are incomplete, filled with blanks, and sometimes jumbled. But they cannot be underestimated in any case. If nothing else they are the testimony to the victory of human morals in people who were faced with mad bestial forces. Dr. Finderle: “When we disembarked from the boat, we saw in the distance two camps 100 metres apart. In order to show what sort of groups were here and from which distant areas they came (Pakrac, Grubišno Polje under Papuk, etc.) we will take several quotes from statements made by Ustasha guards in Slana, Datković and Matijević, half-literate peasants (who later on joined Partisans). “They chose me to go to Slana as a guard. I was there from June 16 until the Assumption of Mary. When I was on guard duty, approximately 200 metres from the camp I saw that they brought in front of the ranks a Jewish man who wanted to escape by swimming and they shot him. Several days later they shot two Orthodox Christians for the same thing. I heard that there were 3000 Orthodox Christians in the Slana camp. I don’t know where they came from, but they would disembark on upper and lower Slana. There were five to six hundred Jews in the southern camp. 3000 Serbs disappeared in two to three days. During the day they would take them to upper Slana, called Baška Slana and they were told they were going to Germany to work. I saw how they boarded them into a boat and drove towards Rojanka where they handed them over to other Ustashas, who would then throw them into a pit on Velebit. I heard this myself from Ustashas who were in Slana. From an elevated point I could see Sergeant Frane Šljivar from Bosnia kicking women who were under a tent, one by one. Wrong orientation; the Jewish camp was to the north (northwest in fact). Rojanka, a bay to the south of Karlobar under Velebit. There were no tents. Maybe they stretched a rug against a drywall or something else, or they were in the shade of the barracks. People from Pag often say incorrect words when trying to use standard “gentlemen” speech, not their own dialect.